I grew up reading science fiction and comic books. I also distinctly remember being promised flying cars and cities in the sky by now. By the year 2000, I was supposed to be zipping to work in a vehicle built to beat city congestion by flying over it. You can imagine my disappointment when the prominent tech story at the turn of the century was the Y2K bug? Engineers at Uber have finally built a prototype flying taxi. It’s better late than never I suppose. Still, we have yet to see plans for a city in the clouds, but at least one company has been putting efforts into designing “Skyports” to go along with Uber’s autonomous passenger drone. Flying vehicles, taxis or otherwise, need places to take off and land. A car launching from the middle of the street in a traffic jam might look spectacular and make for a good scene in a movie, but it is not very practical or safe. Ideally flying vehicles will need platforms above the ground to take off and land just as helicopters do. 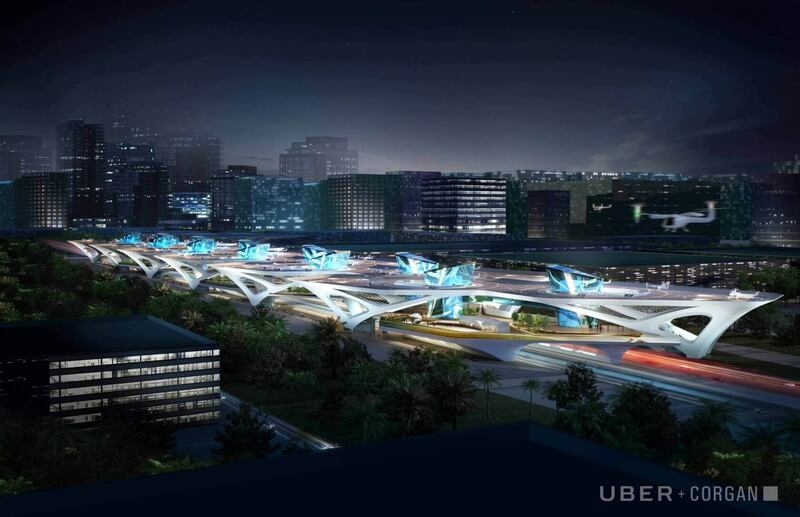 Fortunately, architecture firm Corgan has been thinking about this and unveiled several design concepts for Skyports at the Uber Elevate Summit. While these facilities will not be housed in the clouds, many of them have that “George Jetson” look about them. Aside from appearing to come right out of a Sci-Fi movie, the facilities dubbed “CONNECT” would allow Uber to conduct business with its flying taxi service on a much grander scale. Corgan has developed a modular design for its Skyports that can be deployed just about anywhere. Leasing the top level of parking complexes or the roof of tall buildings are obvious choices, but the design can also be placed at ground level given enough open space. The modular structure also allows the facilities to stack, so as UberAIR grows in a region, so can the Skyport. Since it can extend upward, the need to purchase more land will help keep costs low. It may not be a flying city, but on top of a skyscraper, it would be close. Corgan did not mention any dates or locations for deployment, but presumably, much of that will depend on when Uber can get its air service off the ground (pun intended). For now, it has said it will begin testing the autonomous drones by 2020 with plans to offer passenger services by 2023 in Los Angeles California and Dallas Texas. If all goes as planned I should be seeing my childhood fantasy become reality in my lifetime.